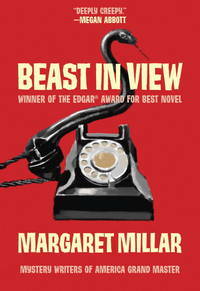 Beast in View is a suspense novel and psychological thriller by Margaret Millar which won the Edgar Award in 1956, was adapted for an episode of the television series Alfred Hitchcock Presents in 1964, and was included on a list of the The Top 100 Mystery Novels of All Time issued in 1995 by the Mystery Writers of America. Random House, New York, 1955 First Edition, First Printing with the words "First Printing" printed on the copyright page. This copy is SIGNED by Margaret Millar on a laid in signature. This ORIGINAL dustjacket has the $3.50 printed price present on the front flap with minor wear to the edges. The book is in great shape. The binding is tight with NO cocking or leaning. The pages are clean with NO writing, marks or bookplates in the book. A sharp copy of this First Edition SIGNED by the author.. Signed by Author(s). 1st Edition. Hardcover. Fine/Near Fine. Random House, 1955 First Edition, First Printing. A very good dustjacket with some wear to the spine and edges. This original First Printing dustjacket has the $3.50 price present on the front flap. The book is in excellent condition. The binding is tight, and the boards are crisp with minor wear to the edges. The pages are clean with some discolorization to the front endpaper. There is NO writing, marks or bookplates in the book. Overall, a lovely copy of this TRUE FIRST EDITION in collectors condition.. 1st Edition. Hardcover. Near Fine/Near Fine. 1990-03-06. New. Ships with Tracking Number! INTERNATIONAL WORLDWIDE Shipping available. Buy with confidence, excellent customer service! Mystery Guild. Hardcover. 073940685X New Condition. . New. Mystery Guild. Hardcover. 073940685X Like New Condition. . Fine. Orion (an Imprint of The Orion Publishing Group Ltd ), 2002-10-17. Paperback. Used:Good. 2011-07-09. New. Ships with Tracking Number! INTERNATIONAL WORLDWIDE Shipping available. Buy with confidence, excellent customer service! Carroll & Graf, 1999-11-30. Mass Market Paperback. Used:Good. Mystery Guild, 1990-01-01. Hardcover. Used:Good. 1984-02-01. Good. Ships with Tracking Number! INTERNATIONAL WORLDWIDE Shipping available. May not contain Access Codes or Supplements. May be ex-library. Shipping & Handling by region. Buy with confidence, excellent customer service! 1990-03-06. Good. Ships with Tracking Number! INTERNATIONAL WORLDWIDE Shipping available. May not contain Access Codes or Supplements. May be ex-library. Shipping & Handling by region. Buy with confidence, excellent customer service! 1999-07-09. Good. Ships with Tracking Number! INTERNATIONAL WORLDWIDE Shipping available. May not contain Access Codes or Supplements. May be ex-library. Shipping & Handling by region. Buy with confidence, excellent customer service! 2011-07-09. Good. Ships with Tracking Number! INTERNATIONAL WORLDWIDE Shipping available. May not contain Access Codes or Supplements. May be ex-library. Shipping & Handling by region. Buy with confidence, excellent customer service! Intl Polygonics Ltd, 1984-02-01. Paperback. Used:Good. Orion Pub Co. PAPERBACK. 0752851748 New Condition. . New. Carroll & Graf. MASS MARKET PAPERBACK. 0786706678 New Condition. . New. Carroll & Graf. MASS MARKET PAPERBACK. 0786706678 Like New Condition. . Fine. Carroll & Graf. MASS MARKET PAPERBACK. 0786706678 New Book. Purchased from Sale Table at local book retailer(all new books). I have examined all aspects of this volume and find no flaws whatsoever. (Note:Your Satisfaction is Guaranteed. If you are not completely happy, we will refund your money immediately...no questions asked. Books purchased before 11am EST normally shipped same day.) . New. Orion Pub Co. PAPERBACK. 0752851748 Like New Condition. . Fine. SOHO. New. 7.52 x 5.07 cm. John Curley & Assoc, 1984-08. Paperback. Good. Soho Syndicate. Literature & Fiction. New. New. New. New. New. New. New. Brand New: This item is brand new unopened, never used and still in its original manufacturer condition. Soho Syndicate. PAPERBACK. 1681990369 Special order direct from the distributor . New. Phoenix. PAPERBACK. 1780220227 Brand New ,Original Book , Direct from Source , Express 5-8 Business days worldwide Delivery. . New. Orion Pub Co. Used - Acceptable. Ships from the UK. Former Library book. Shows definite wear, and perhaps considerable marking on inside. 100% Money Back Guarantee. Your purchase also supports literacy charities. Mystery Guild, 1990. Hardcover. Good. Soho Syndicate. PAPERBACK. 1681990369 . New. Soho Syndicate. PAPERBACK. 1681990369 Minor shelf wear . Very Good. Soho Syndicate. PAPERBACK. 1681990369 signs of little wear on the cover. . Very Good. Carroll & Graf, 1999-12-20. Paperback. Good. Soho Syndicate. PAPERBACK. 1681990369 *BRAND NEW* Ships Same Day or Next! . New. Soho Syndicate. PAPERBACK. 1681990369 *LIKE NEW* Ships Same Day or Next! . Fine. Orion Pub Co. PAPERBACK. 0752851748 . Good. 2002. Bantam Mystery. Used - Good. Good condition. GB: Corgi (Transworld), 1960. SC787. 2/6.. 1st Thus. Paperback. G++. Avon Books, 1974. Paperback. Good. IN STOCK - 1974 First Avon Printing - nice vintage collectible - solid binding - usual all over agewear - no markings -tanned pgs & cvr - mailed first class within 2 bus. daysWe do not ship to all countries. Please contact us about shipping charges before ordering from outside of the U.S.A. Thank you. Bantam Books. Good. 1966. Paperback. Paperback, in Good condition, a little writing inside the cover, pages are clean and unmarked, paper is tanning with age, covers have some scuffing and a couple small creases, solid binding, a good reading copy, A Bantam Gothic Novel, . Intl Polygonics Ltd, 1984-02. Paperback. Good. Soho Syndicate. PAPERBACK. 1681990369 Brand New Direct from the Publisher! Not overstocks or marked up remainders! Ships in a sturdy cardboard container with tracking! . New.